I used to love eating crab rangoon at Chinese buffets or ordering it for takeout, so when I had a random hankering for this deep-fried item of sin this weekend, I made a vegan version of them. I replaced the cream cheese easily with Tofutti non-hydrogenated cream cheese, but was stumped on what to use for the crab. I had tempeh on hand, which I have used to make crab cakes before, but when I looked deeper into my cupboards, I came across a can of young green jackfruit—which I found in Chinatown a couple months ago for under two dollars—and decided that this would function as my “crab” for this application. These of course taste best deep fried, but can also be folded into triangles and baked instead. A Thai chili sauce provides the perfect blend of heat and sweetness to balance out this this rich and decadent dish. Drain the jackfruit and place into a crockpot with the broth, ensuring all pieces are covered with the liquid, adding a bit more broth if needed. Cook the jackfruit for 2-3 hours on the highest setting. Add in the scallion and sesame oil, and mix to combine. Then, add in the softened vegan cream cheese and stir until well combined. Set aside. To deep fry them, place several inches of canola or grapeseed oil into a small saucepan. 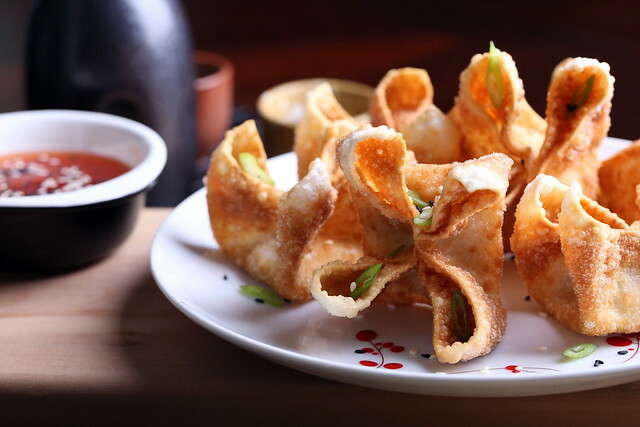 To prepare them for frying, place a teaspoon of the filling in the center of the wonton, then fold them. I folded them by dabbing water at 12, 3, 6 and 9 o’clock, then folded 12 and 6 o’clock up like a taco, then pushed in the sides at 3 and 9 o’clock, pinching them well to form a seal. Heat the oil over medium-high heat for about 7 minutes. Throw a pinch of the filling into the oil. If it sizzle immediately, you are ready to fry. Slowly drop 2 of the wontons into the hot oil until golden brown (it should only take 45 seconds or so). Transfer to a paper towel to drain, and repeat until all of the wontons are fried. To bake them, preheat your oven to 425. Place a teaspoon of filling in the center of a wonton. Run a bit of water with your finger around all of the edges, then fold it over to create a triangle. Place them onto a well-oiled baking sheet. Bake for about 7 minutes on one side (or until golden brown), flip, then bake the other side for an additional 4 minutes, or until golden brown. Serve immediately with the homemade or prepared Thai chili sauce. Wow; I've never had the crab version of these fried wonders, but I recall the cheese version being pretty impressive and these look identical to those in my memory. I'm always amazed at the versatility of jackfruit! 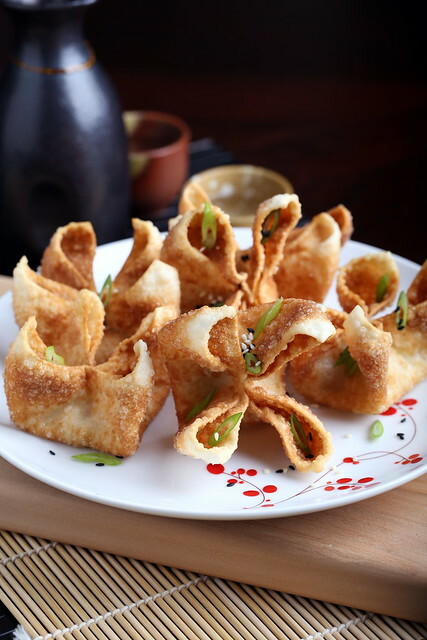 Crab rangoon was a favorite of mine growing up — I could eat a whole plate by myself and then go back for more. These look absolutely delightful! I hope to try them soon. i have always wanted to try crab rangoon! this looks so cool! Brilliant! I used to love crab rangoon. Your vegan version looks amazing! OH MY GOD I LOVE YOU. I looooved crab rangoon. Do you think this would work well with heart of palm as a substitute for the jackfruit?? Tay, I haven’t tried that, so I can’t say for sure, but it’s worth a shot! If you try with good results, I’d love to know! Hi Daisy, yes on draining, and I’ve updated the recipe text to make that more clear. I hope you enjoy the recipe! My filling melted. Any tips or ideas why? ;( they were delicious but the filling wasn’t there… just flavor. Should I freeze them before I fry them? That’s happened to me a bunch of times when it comes down to cooking anything filled. I’ve learned to not put as much filling as i did before, and to securely and firmly make sure that I am pressing the dough ends tight enough so no leakage of filling comes out when it comes down to cooking time. Hope that helps! Thank you for allowing me to not lose hope in being vegan. Crab rangoon has always been my weak spot and quiet frankly I could find myself not caring for any plate put in front of me but never with crab rangoon. You were the first person to make me truly happy with this, and I’m disappointed that i haven’t found this sooner even. Mar, so happy this hit the spot! Thanks for your kind feedback. Mar, hi I just made these… I put a little dish with water next to my tray of wonton wrappers & after you add the teaspoon of filling, dip a finger in the water & run it over the edges of the wonton wrapper before folding it up. Also make sure it’s pinched closed. 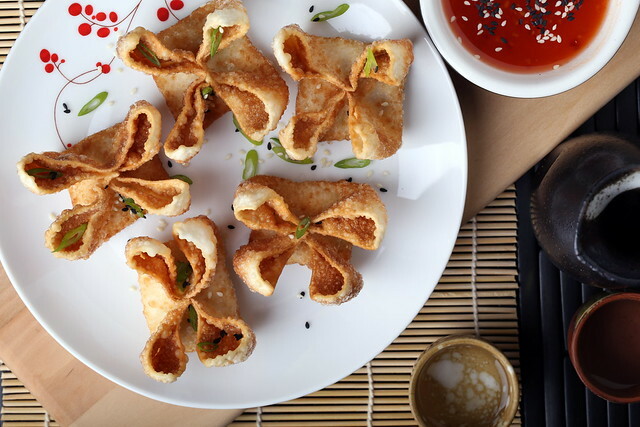 You could also fold like a triangle instead to fry it verses having a fancy looking wonton. Hope you try it again, ours were perfect! Hi Erin! Lovely recipe, I’ve got all my ingredients but no crock pot… what would be the best substitute method of cooking the jackfruit with the broth on the stovetop? Thanks can’t wait to make them! Daisy, I would just simmer the jackfruit on your stovetop until soft. Be sure to drain and press after shredding. I hope you enjoy the recipe! WOW! I can’t thank you enough! These were so delicious! I made these for another vegan & two of my omnivore friends, everyone loved them & waited patiently for more! I did the jackfruit on the stovetop with the vegetable broth, I brought it to a boil & then put it on medium for about 15 minutes. I shredded it while it was simmering also to help save me some time, as I was very anxious to finish them! Also as I had seen someone had “lost” their fillings in an above comment so I used a bit of water on my finger to draw around the edges of the wonton wrapper before I folded them & I made sure to pinch them tight as you suggested. This recipe is perfect! Thank you so much! It was amazing to recreate one of my childhood favorite foods I hadn’t eaten in over 10 years! Daisy, Thank you for your feedback and so happy it was a success! Protein-Happy Quinoa Wraps from Vegan Sandwiches Save the Day!